An online service that claims to offer 46 million users a free and secure way to browse the web anonymously is plagued with issues that allow customers to be tracked and hacked, security researchers say. Hola is an Israeli-based browser plugin that since 2008 has given users the ability to surf the web by routing traffic through the connections of others--a feature the company has touted as a means of bypassing restrictions, such as country-specific censorship. However, on Friday this week, a small group of security experts announced that multiple vulnerabilities within the application can seriously compromise the security of its customers. Hackers can actually remotely execute any type of code with system-level privileges on machines of potentially millions of Hola users. According to the team that discovered the flaws--an internationally dispersed group of researchers and developers, including former members of the infamous hacking group LulzSec--issues with both Hola’s code and the company’s corporate policies pose a number of problems. “Hola lets you have access to information that is otherwise not available in your geography while protecting your online privacy,” the company explains on its website. “We have built Hola for you, and with your privacy and security in mind,” it boasts. Yet in the “Adios, Hola!” report published on Friday, the researchers say users of the supposedly privacy-minded plug-in can actually be tracked while they browse the web because of a bug that lets remote sites see potentially personal information about the Hola user’s computer, including uniquely crafted IDs that differ with each installation. More critical, however, is their assertion that any of the millions of users could end up having their entire computer compromised due to an error in the software’s code: if a user is navigating web pages with the Hola plugin, a simple click of a link on a malicious site is all it would take for a hacker to remotely execute any type of code on the victim’s machine, the researchers say. “They let anybody execute programs on your computer,” the report claims. To prove as much the researchers have embedded a link in their report which, when clicked, launches the targeted computer’s calculator application. “It's worrying when you see poorly designed security products; it's even worse when you see privacy products that appear to be created specifically to take advantage of people looking for safety online," Morgan Marquis-Boire, a senior researcher at University of Toronto's Citizen Lab, told RT's Andrew Blake on Friday. The flaw has been in the plug-in since at least 2013, the group says, and the remote code execution vulnerability can be exploited in the FireFox add-on on computers operating Windows. Other browsers and operating systems, including mobile devices, are vulnerable to the exploit that discloses personal user details, the researchers say. With regards to being able to remotely execute code on a targeted machine, the researchers say Hola users face potentially dire consequences. “If an attacker can perform a Man-in-the-Middle attack against a target running the Hola client on Windows - either as a network adversary, ISP, intelligence agency or another Hola client acting as an exit node -- they can create a connection seeming to originate from the hola.org or client.hola.org hosts to the local websocket port,” the report reads. From there, code can be executed by a hacker thousands of miles away, the result of which could give attackers control over entire systems. “This kind of security issue can only happen if a developer is either grossly incompetent, or simply doesn't care about the security of their users. It's negligence, plain and simple, and there's no excuse for it,” the researchers said. 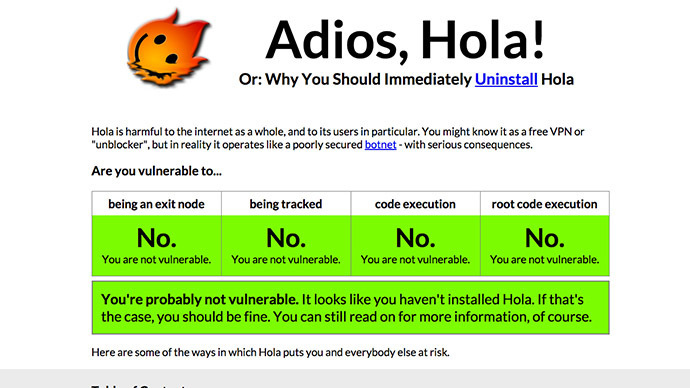 According to the group, the only way to avoid being potentially exploited by the bug is to uninstall Hola. The latest Hola news comes just days after its Vilenski confirmed the company sells its users’ bandwidth, profiting off of the internet connection of customers by offering a commercial service, Luminati, that charges per-gigabyte with respect to internationally-routed traffic sent through Hola. While computer hackers routinely rely on compromised networks of computers known as 'botnets' to wage assaults on systems with the manpower of multiple machines, flaws within Hola allow customers of its sister company to pay money in order to send an onslaught of requests over the web through the computers of other nodes. “When a user installs Hola, he becomes a VPN endpoint, and other users of the Hola network may exit through his internet connection and take on his IP. This is what makes it free: Hola does not pay for the bandwidth that its VPN uses at all, and there is no user opt out for this,” wrote Fredrick Brennan, the operator of an online image board that he says was attacked this week through the Hola platform..
Now as new details emerge about critical security flaws within the Hola software, the researchers who discovered the vulnerabilities say concerned netizens must consider their options before they decide to deploy a supposed privacy service in order to anonymously surf the web.